65% cacao Fair Trade. A serious twist on snacking. Seriously good. Bark Thins snacking chocolates are a handcrafted twist on traditional chunky bark. Super thin slivers of rich, dark chocolate mixed with refreshingly crunchy mint. 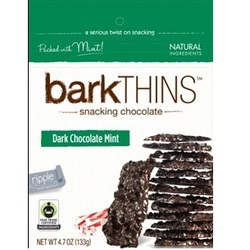 Bark Thins are perfectly portioned for the serious chocolate lover. Fair Trade cocoa. Natural ingredients. No artificial flavors. 65% cacao. Non-GMO. Extraordinary begins with an inspired twist.